Spring 2016 Speakers and a Birthday Party!! We had 3 great speakers from March through May, 2016! They were all such fun, and they shared so many beautiful quilts! Marge Tucker was our guest in March. She designs and pieces her quilts improvisationally. If you missed her talk you can see some of her great quilts by clicking on the link to her website. They are amazing! Tina Craig was our speaker in April. She gave a lively trunk show! You can see two of her quilts in the photo at the top of this post. 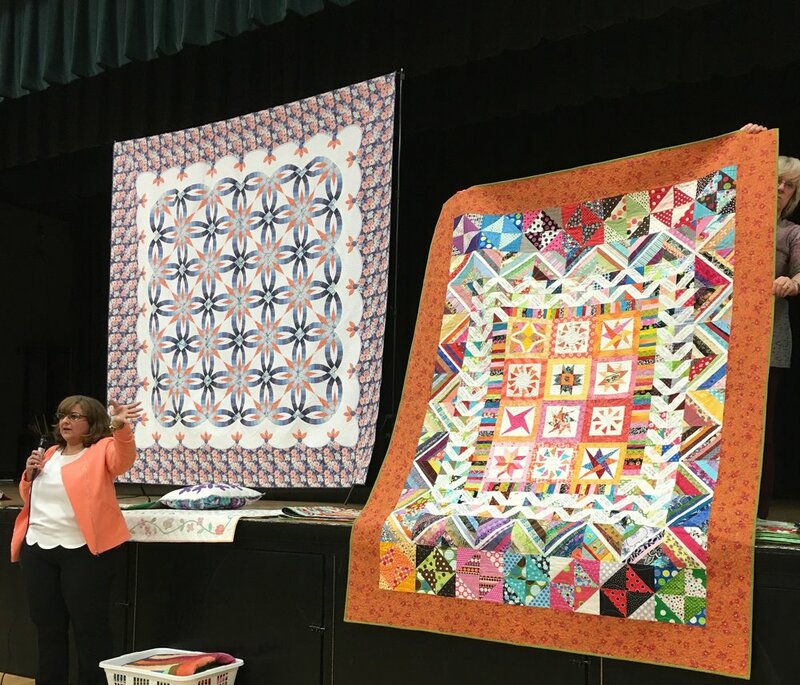 She shared her lifetime journey in quilting! Tina is an active blogger. You can click here to see what she has been up to since her visit. Don't miss the fun tutorials on her website! Our third speaker was The Singing Quilter. We were lucky to have Cathy Miller for what was her last concert on her last tour!! I think this one was even better than the concert we heard a couple years ago! She definitely got all of us singing along this time! Here is Cathy's blog post about this last tour. At the end of her post is a slide show of the Lucy Boston blocks from the "Hexagons: State of the Art" workshops. She taught this workshop to our guild while she was here. Do you recognize any of the blocks in her slide show? Our last event of the year was our annual June Party. And what a party it was!! 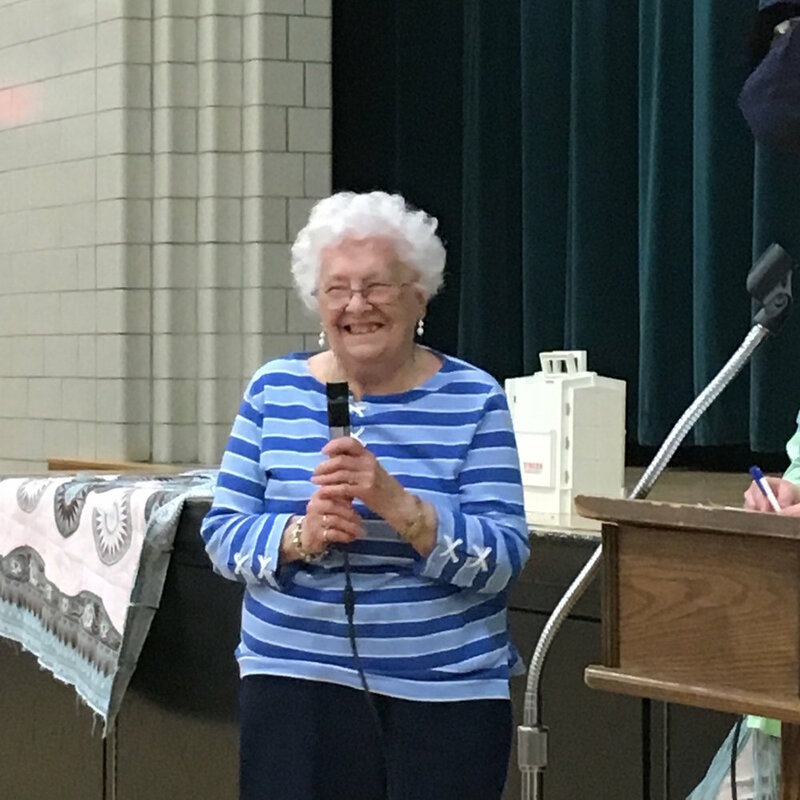 We had a great time celebrating Margaret K's birthday and giving her the honor of being a Member for Life! Celebrating Margaret's birthday was the perfect way to wrap up to a great Spring at PBQ!